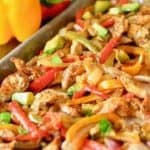 Sheet Pan Fajitas! Tender chicken, fresh veggies, all cooked up on the same pan! Serve with tortillas, on top of a salad or wrapped up in a lettuce wrap! Easy. Healthy. Versatile. Sold! We posted this a while back and you guys loved it so much…. we redid them! You will love this easy to make sheet pan dinner recipe! Cumin, chili powder, garlic, salt and pepper into some olive oil makes your perfect fajita marinade. 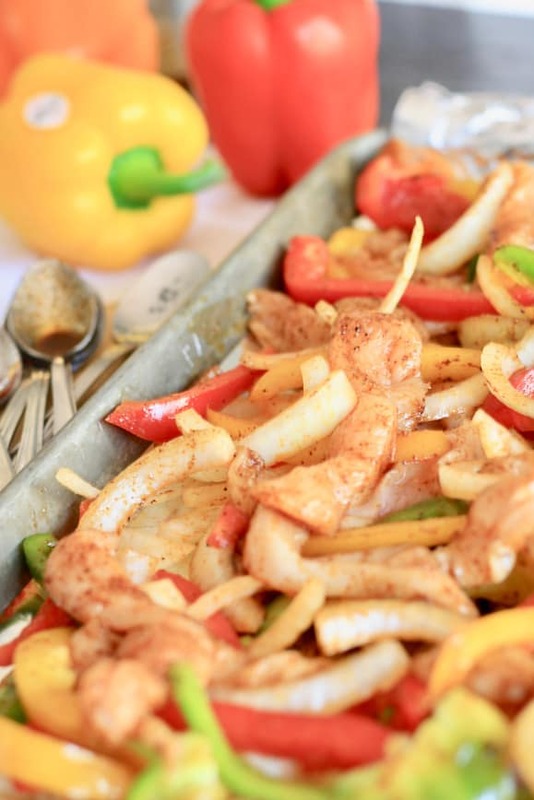 Check out this video to see how easy these Sheet Pan Fajitas are to make! 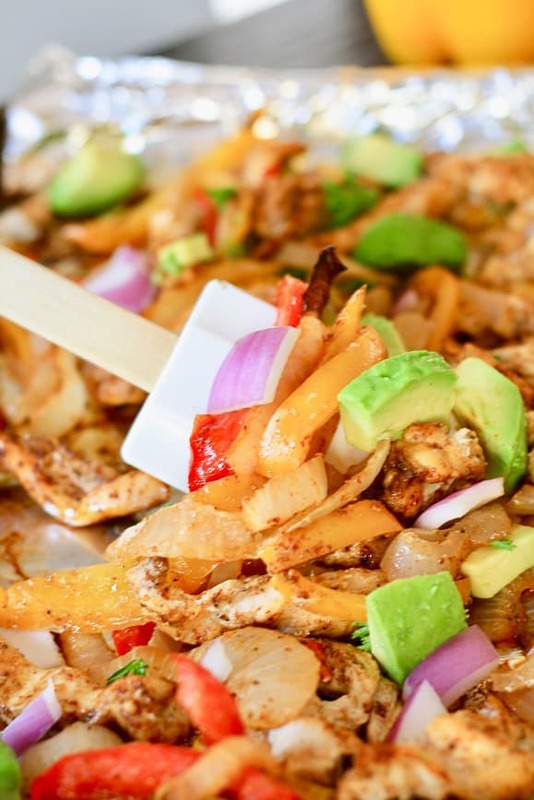 HOW TO MAKE SHEET PAN FAJITAS! Slice your veggies and chicken. Keep them the same size so they cook at the same time. We used a variety of colored peppers. We sometimes throw in a sliced poblano for a little extra zing! We love this set of three sheet pans, a size for everything! 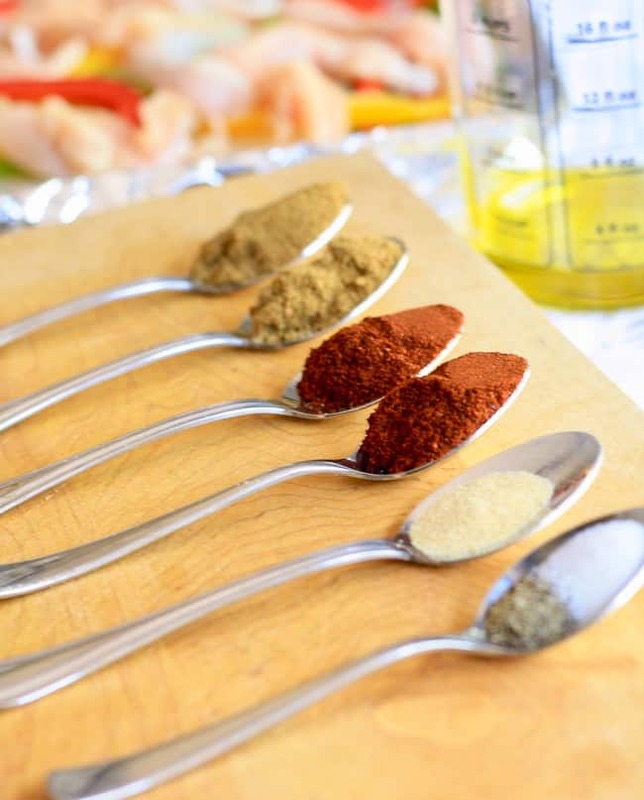 Measure out all your spices and toss right into the olive oil. We love the idea of everything dumped onto a sheet pan, tossed together then thrown in the oven and boom….dinner done! In fact I love the concept so much, I am busy developing several more sheet pan recipes to share with you soon. Been up to my elbows in sheet… pans that is..argh, somebody stop me…. Another few reasons to love this recipe. It’s healthy, low fat, low carb, Paleo and Whole30 compliant. It also feeds a crowd and provides leftovers for that boring old lunchbox. Kick it up with hot sauce, or maybe a jalapeño mixed in with the veggies if you like spicy. 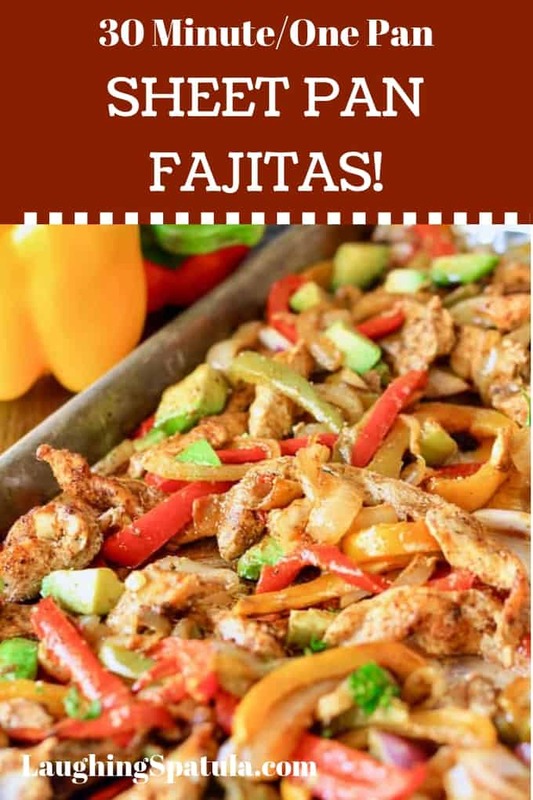 Serve with sour cream, avocado, grated cheese…all your favorite fajita fixings! Wrap it all up in a warm tortilla, lettuce leaf or dump it on salad! We love the flavor of this chilled. 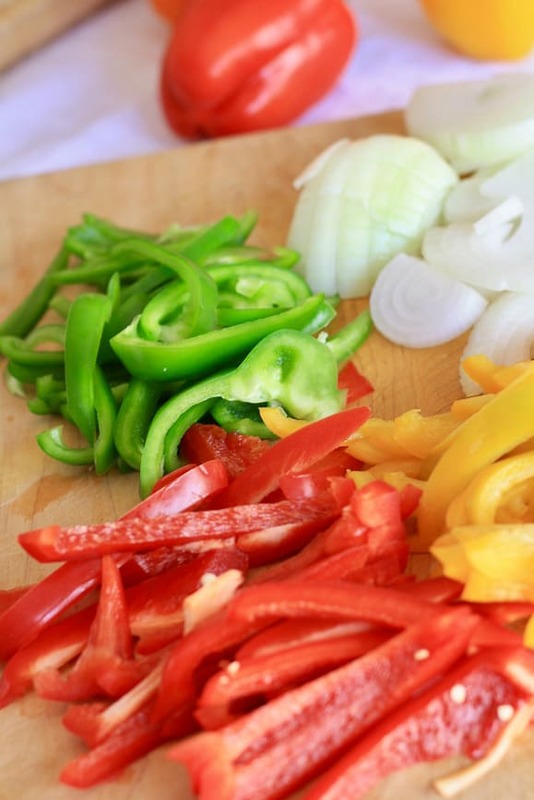 Slice your chicken and veggies about the same thickness to ensure everything is done at the same time. Use the convection feature on your oven if you have it, it will brown the veggies nicely. You can substitute a casserole dish or 9 x 13 cake pan in a pinch. See all our fast healthy dinners here! Top yours with avocado, cilantro and red onion (like below) and toss around to warm those up- adds a ton of flavor without a ton of calories! If you love the ease of this dish, you will loveour Chili Lime Shrimp Fajitas too! 10 minutes to prep and 10 minutes in the oven! You can see all of our Sheet Pan dinners HERE! Our latest is this Sausage Sheet Pan Dinner with Sweet Potatoes and Veggies! – super healthy and great meal plan recipe. A easy and family friendly one pan dinner! Top a salad, fill a tortilla or wrap it up in a lettuce or bread wrap! In small bowl combine oil, chili powder, cumin, chili flakes, garlic, salt and pepper. 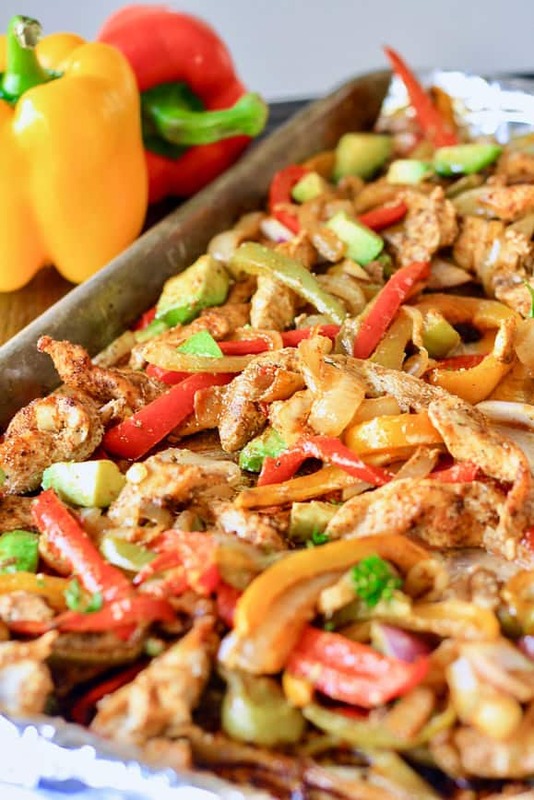 Toss chicken, veggies and oil mixture together on a large sheet pan with one inch edge. Bake for 25-30 minutes until chicken is cooked and the veggies are soft with a crispy edge. Serve with tortillas, sour cream, avocado and all your favorite fajita fixins! This sounds great! Do you think I could freeze individual servings to use later for lunches? Keeping in mind that veggies just don’t freeze all that well and if you don’t mind that then yes…I’d say it would work great! Small container with a flour tortilla on the side would make a great lunch! I believe I would eat this as is – will see if I have time to get onto the bbq this weekend and let you know how it went. Hi Cheryl – Thanks for the comment and you are right! Glad you found me and hope you come back to visit soon! We first made this according to the recipe, then we did make it on the grill using foil packets. Worked just as nicely, and cleanup was a breeze! We might even use this recipe while camping. Made this for supper tonight. Was a huge hit with the family. Hi Denise – this is my go to dinner! With or without tortillas it’s always a hit…I’m so glad you liked it! Made this for dinner tonight . Awesome! I’m so running out of ideas for dinner with this frigid weather. Below zero temps this past week , has stopped me from using the grill outside. It’s so hard to please the boys and me :). I can’t wait to serve it to the girls when they are home from college. Something the whole family will enjoy! And so easy! 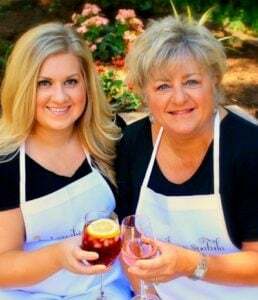 I’m so glad you liked the recipe, It’s one of my favorite! I make this all the time. Go to healthy dinner…yay! Thanks Pat! The variations on the meal are endless and they sure are easy! I really love the idea of dumping food in a sheet pan for an easy dinner. This recipe is marvelous. I was disappointed to find out that Martha has a sheet pan recipe cookbook…argh. So hard to be original anymore! I’m hoping mine turns out, I’m cooking on 350 for an hour covered with foil, as I have errands to run. My kiddo will throw the tortillas in after an hour and we will eat within 30 minutes, hopefully. Fingers crossed. You are so sweet! Thanks for following up with your comment !